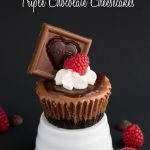 I first shared this recipe on CentslessMeals where I am a contributor. 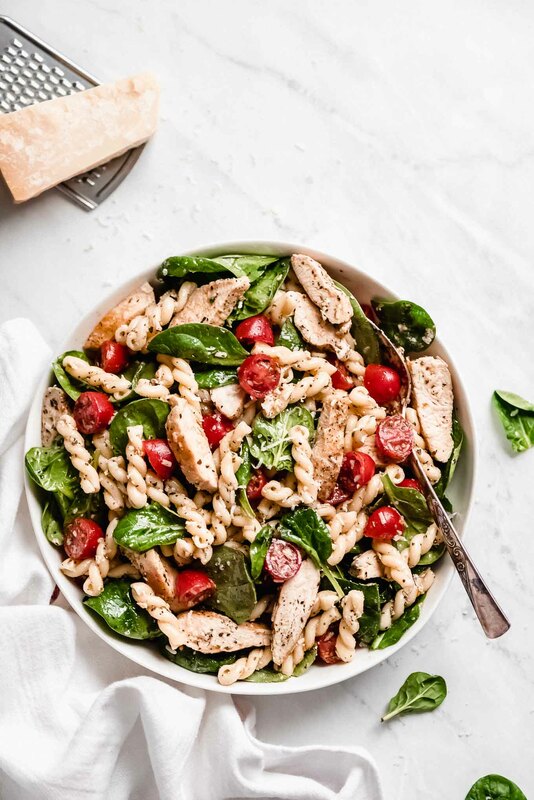 This easy Chicken Pasta Salad with Spinach & Tomatoes is a refreshing simple dinner. It’s filled with fresh veggies, seasoned chicken, pasta, and Parmesan cheese. This flavorful salad is great for warm weather gatherings! 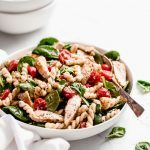 ‘Tis the season for outside celebrations and this Chicken Pasta Salad with Spinach & Tomatoes needs to be present! 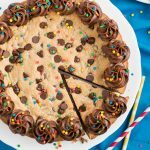 Whether you’re gathering for Mother’s Day, graduation, or just for fun, you need good food. 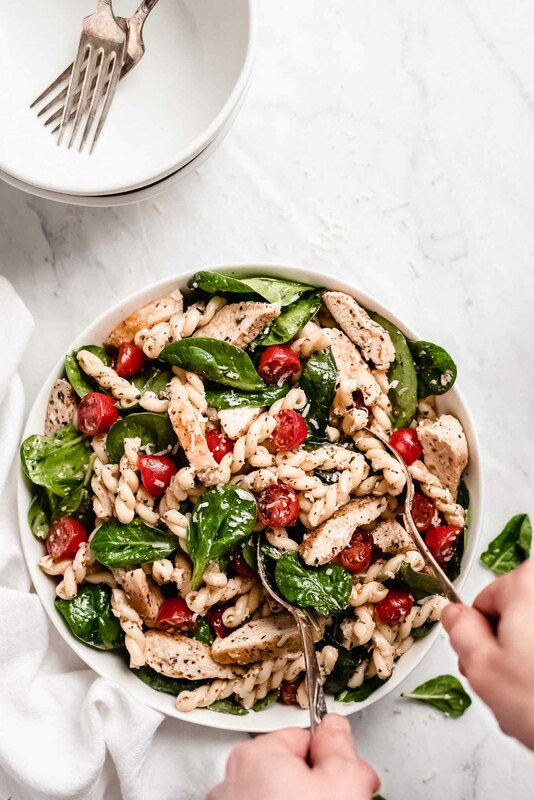 This chicken easy pasta salad is sure to impress but don’t forget to start out the evening with a delicious appetizer like Tomato Basil Bruschetta and end with The BEST No Bake Key Lime Pie. What I love about pasta salads, particularly this Chicken Pasta Salad, is that they are (often) a complete balanced meal. 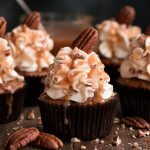 It has a protein, grain, dairy, vegetables, and good fat. You can make this salad even more nutrient dense by adding in more veggies or using a whole grain pasta. My husband is always looking for more ways to eat more protein so when I meal prep it for his lunches I use this protein pasta because it adds 10 more grams protein per serving. You’ll first start out by boiling salted water for your pasta and cooking them al dente according to the package. Once done, drain, and then pour into a bowl of ice water to cool it down quickly so that it stops cooking. Drain off the water again and then place in a large mixing bowl. While the water is boiling you can cook the chicken. This can be done on the grill or in a pan. Or you can take a short cut and just use leftover chicken, rotisserie chicken, or buy precooked grilled chicken. Once cooked, cool and cut up the chicken into thin slices. To make the dressing, whisk together the olive oil, dijon mustard, basil, oregano, garlic powder, and salt & pepper. 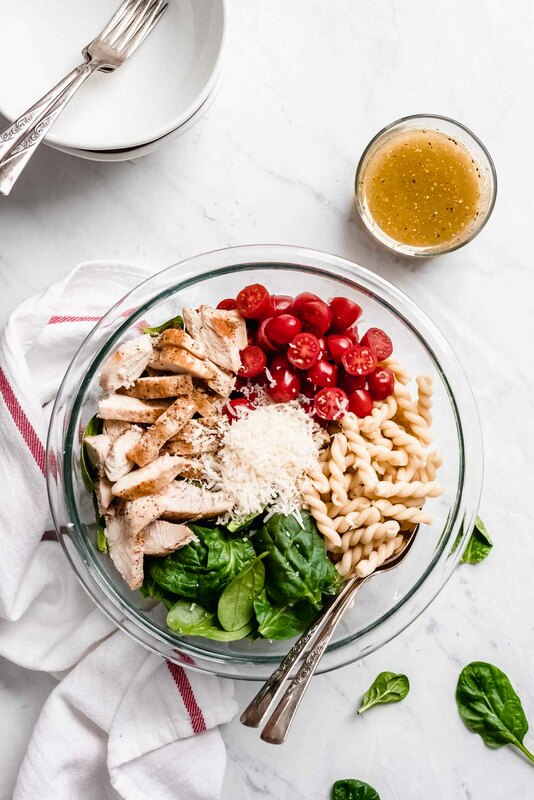 Place the pasta, chicken, tomatoes, and spinach together in a large bowl and then pour the dressing over the top. Sprinkle on the parmesan cheese, toss, and serve. If you are not planning to eat this right away, you can prep the salad by mixing everything together EXCEPT the spinach or the dressing. Spinach wilts quite fast once dressing is added so keep either the spinach or the dressing in a separate container until right before eating. 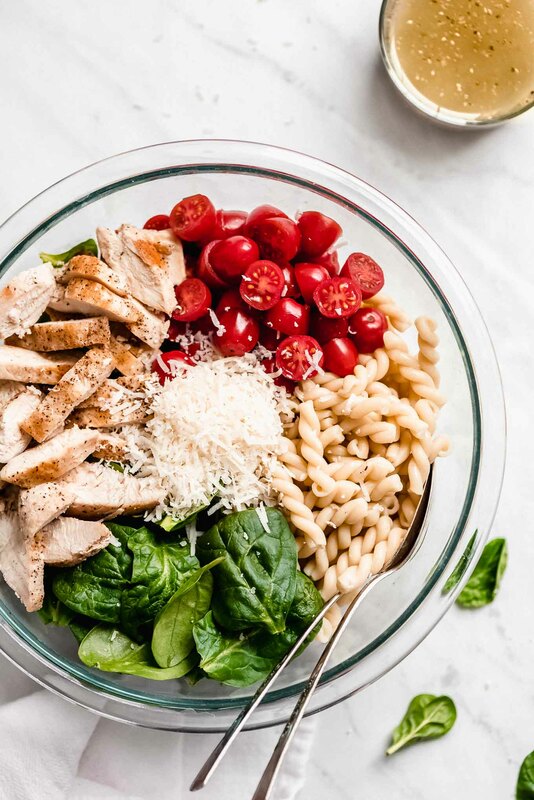 If you are meal prepping this salad for a lunch, put the salad (minus the spinach) in your container and then place a handful of spinach in a Ziploc bag and mix it into the pasta just before eating. You can use any type of short pasta you’d like. I love the fun shape of Gemelli pasta but penne, fusilli, farfalle… If you want to add more fiber to the meal, choose a whole grain version. A different oil can also be used. If you like a strong oil you can forgo the “extra light” tasting olive oil. 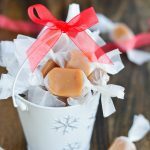 If you only have canola or vegetable oil on hand, that works too. Feel free to switch up the vegetables. Don’t like tomatoes? Use bell peppers. Don’t like spinach? Use romaine or kale. If you really like cheese, mozzarella pearls taste really good in pasta salads. Feta and goat cheese are also delicious. 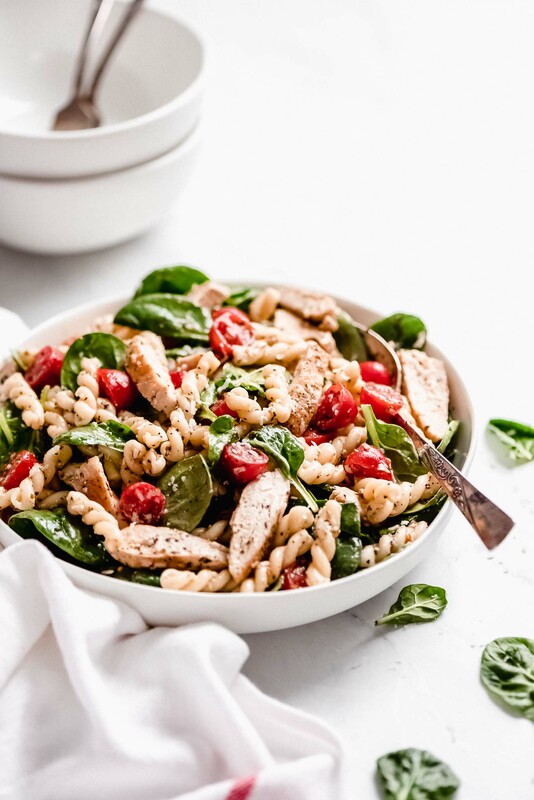 This Easy Tomato & Spinach Chicken Pasta Salad is a refreshing simple dinner. It's filled with fresh spinach and tomatoes, seasoned chicken, pasta, and Parmesan cheese. This flavorful salad is great for warm weather gatherings! Boiling salted water and cook pasta al dente according to the package. Once done, drain, and then pour into a bowl of ice water to cool it down quickly. Drain off the water and place in a large mixing bowl. While the pasta boils, cook the chicken. Season both sides of chicken breasts with salt and pepper. Cook on a medium-high grill or skillet on both sides until center is 165 degrees F. (About 5 minutes per side, depending on thickness.) Let cool and then slice. Assemble by placing pasta, chicken, tomatoes, and spinach** together in a large bowl. Pour the dressing over the top. Sprinkle on the Parmesan cheese, toss, and serve. In a jar or liquid measuring cup, whisk together the olive oil, vinegar, Dijon mustard, basil, oregano, garlic powder, salt and pepper. *You can substitute with leftover chicken, rotisserie chicken, or buy precooked grilled chicken. **If you do not plan to eat the pasta right away, add everything to the bowl EXCEPT the dressing or the spinach. Once the spinach gets wet it will wilt quickly so either keep the dressing in a jar or the spinach in a bag.